There is no one better than your satisfied consumers to narrate your success stories. 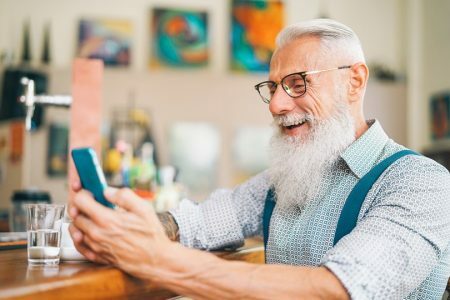 With as much as 70% of people relying on customer reviews before making a purchase, Consumerist.com reveals that it’s a good idea to include a review or comment expressed in your customers’ own words when marketing your brand on different channels. 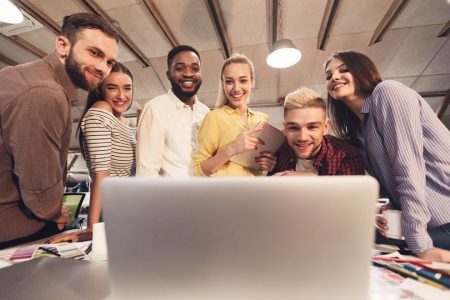 Reviews can make or break a brand and encouraging satisfied customers to share their positive experience online, especially on social media platforms can help businesses generate social proof of their efficient services. Reading a good review builds trust in the buyer about the quality and credibility of your product or service. In fact, positive reviews can help you make people understand how your product can improve their lives. Plus, your chance of drawing in more traffic to your site increases when customers write good reviews about your brand on social media platforms. People will take out time to read about the reviews, be it on your website, in your e-mail newsletters or in print materials. 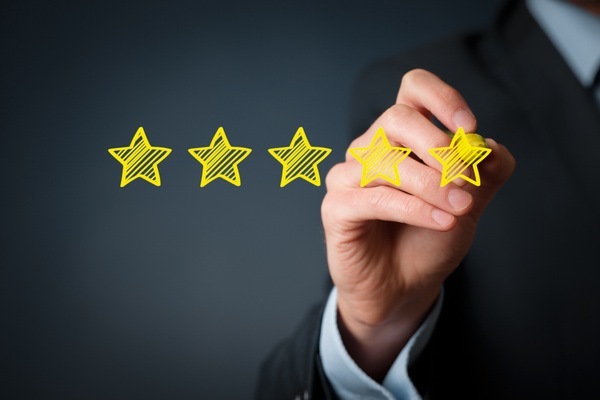 Let’s check out 7 creative tips to effectively market your brand using customer reviews. Proudly feature your best unedited reviews at a prominent spot on your website – bold and upfront. This is nothing but word of mouth publicity and will lure your visitors to buy your product or hire your services. Adding the name and photo of a customer will make the review even more authentic and credible. But make sure you take permission from the customers first, before publishing their name or picture on your site. It can be done on your homepage or on all web pages. You can also set up an entire page dedicated to your glowing testimonials or create a series of reviews on your blog. Apart from adding credibility to the site, customer reviews answer visitor’s questions about product quality and, of course, encourage users to check brand’s social accounts. For instance, Hotsy Totsy, a fashion website known for selling fashion products and accessories online, prominently displays customers’ testimonials and feedback on a separate page altogether. Show to your customers that you care! And this is for both positive and negative reviews. Take notice of the reviews and respond quickly. Publicly ask your customers to contact you directly so that you can discuss the problem. Show them that you are willing to do all you can to rectify the problem. This will build your customers trust and often sets you apart from your competitors. Even if someone else comes across the review, it will be noted that you had tried to resolve the problem the earliest. 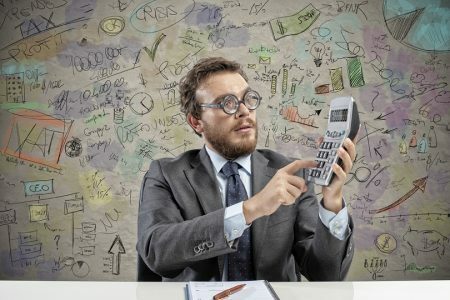 Customergauge.com reveals that responding to feedback is not just for retaining customers but to enhance a positive identity amongst non-customers. 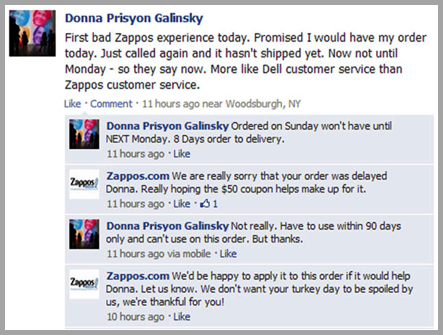 Check out how Zappos does this brilliantly. Try to make the process of reviewing your product or service as easy and quick as possible, so that your products and services receive more ratings and attract more reviews. Customers should never feel burdened while filling in your review forms. A blog published at Kissmetrics.com suggests to keep your review forms short to make it happen with minimum clicks. In addition, it makes sense to make such forms as fun as possible. You can use an online review platform that sends automated review request emails when customers buy from you. Your customers should feel that you are interested in their feedback and want to ensure that they’re satisfied with your products. You could also go for a short survey on your website or a quick poll on Facebook to know about your customers. 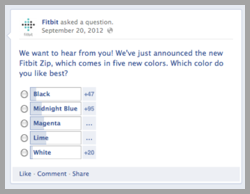 For instance, FitBit conducted a quick poll to draw in traffic to its site. With the content overload on the web, it is difficult to regularly create content that will engage and entertain people equally. This is where it pays to make your customers your brand ambassadors. 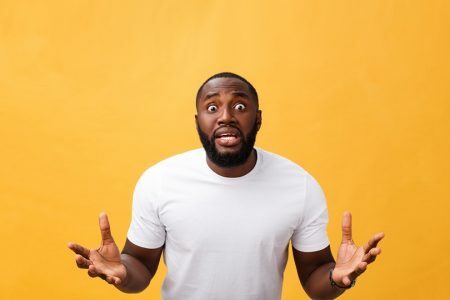 By having a group of customers as your brand ambassadors, you can easily break through with an authentic voice because it will sound different, genuine and most importantly real. With the ever-growing competition on the web, it’s important to make your customer’s in-charge of your brand. There can be customers who run an entire blog on your site, or one or more customers could be in charge of tweeting and posting stories relevant to your product. 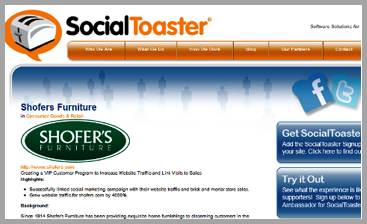 An article on socialmediaexaminer.com reveals that Shofer’s Furniture implemented a brand ambassador program that increased their site traffic by 4000%. Review sites are basically local directories that allow people to share their experience about various businesses and brands. On searching a particular name of a business or product, visitors get reviews and ratings along with the listing. It is an easy way for customers to know what other people think about your brand and business. There are several popular review sites such as Yelp, Review Center and Trust Pilot. So, create an account on all these sites and use it to make you look better. You can also consider advertising on these sites. For instance, Yelp allows you to pick your best reviews and run it in the listing right next to your competitors. Check out the below advertisement on Yelp to understand how it works. But don’t forget the listing should be laid out in such a way that vital elements of your brand pop up. For instance, your logo shouldn’t be buried under the fold or at the bottom of the page and your contact details should be easy to spot. According to Unbounce.com, over 294 billion emails are sent each day. An average person receives 72 emails per day and spends up to 30% of their working day checking out their inboxes. Now, this is unarguably a huge number. So, it’s important that your customers love your emails. Including customer feedback in your promotional emails may encourage your customers to make a purchase on your site. 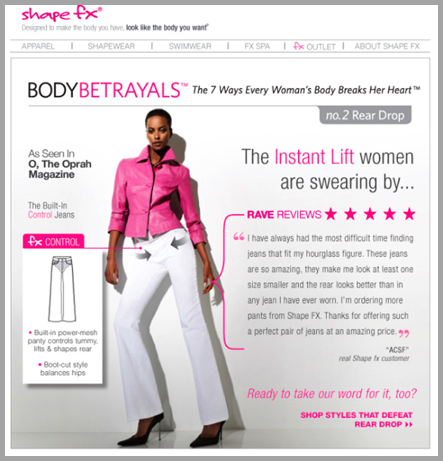 Here’s an email from Shape Fx that successfully adds reviews to its pitch. Social media platforms such as Facebook, Twitter and LinkedIn are popular places for customers to talk about and leave feedback or reviews for a specific product or business. Collect and leverage positive customer reviews by sharing them on your company’s Facebook, LinkedIn and Twitter pages. Adding a customer picture or video will add credibility to your business by showing them why people like you. 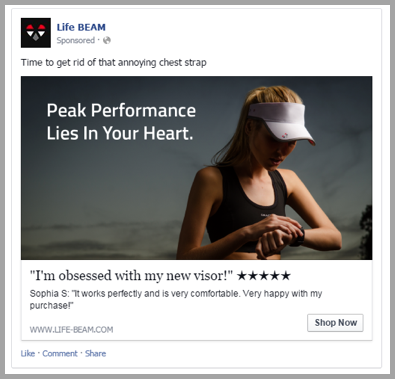 Life Beam does a great job at posting customer reviews on its Facebook page to catch the eye of potential customers. Here’s how company does it successfully. Remember, telling people your business is the best in the market won’t urge them to reach into their wallets. But hearing this message from other customers might compel them to do so. So, if you’ve not been able to incorporate customer reviews and feedback into your marketing strategy to support your brand, now’s your chance. Go for the change. Use customer reviews strategically and don’t shy away from showing off how great your brand is! It’s never too late to get your brand reputation back on track. Is there any other way customer reviews can be used to successfully market and promote your brand? What do you think? Leave your comments and let us know.